Is Ellen Page capable of portraying anything besides a wisecracking, suburban teenager with a major attitude? If not, she’s in danger of being typecast till she’s too old to play another variation of Juno, the spunky, social outcast for which she landed her Oscar-nomination. Meanwhile, audiences will just have to settle for the latest incarnation of that flip persona in Smart People, a dysfunctional-family drama which might as well have been titled Smart Alecks. Ellen plays Vanessa Wetherhold, a high school senior who’s too much of an elitist for to bother having friends or fun. Instead, the academic overachiever spends her free time practicing for the SATs in search of the stratospheric score that will get her into Stanford. She’s also a member of the Model U.N., the Young Republicans and the National Honor Society, extracurricular activities which will look good on her college application. Her father, Lawrence (Dennis Quaid), a pompous Professor of English Literature at Carnegie Mellon, has been emotionally-unavailable to her and her older brother, James (Ashton Holmes), ever since the death of their mother. Her equally-abrasive sibling attends the University, but he has a room on campus, while Vanessa lives at home with her dad. There isn’t much hope for any of these three misfits until the fateful day that Lawrence hits his head and has a seizure after climbing a fence. 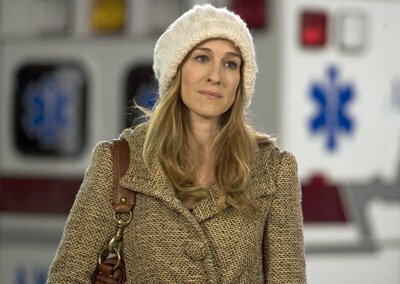 (Don’t ask) He ends up in the Emergency Room where the attending physician is Dr. Janet Hartigan (Sarah Jessica Parker), a former student of his, who still has the hots for teacher. However, rather than pick up on her hints, he morosely focuses on the fact that he won’t be allowed to drive for the next six months. As luck would have it, a ready chauffeur conveniently shows up in his adopted brother, Chuck (Thomas Haden Church), a homeless bohemian who’s broke again and needs a job and a place to stay. In contrast to his relatively-snobbish relations, Chuck is a cannabis-smoking bon vivant with no ambition other than to enjoy life. Upon moving in, he becomes intent on bringing the uptight Wetherholds out of their shells via tough love therapy. In short order, he pressures Lawrence to date (Guess who? ), loosens up awkward James by hanging out with him in the dorm, and humiliates teetotaler Vanessa into getting high for the first time by telling her she’s a robot and needs to relax. Juno 2, and just as inspired. Rated R for profanity, sexuality, and brief teen drug and alcohol abuse.